We sold out of the first Gesha I roasted last week, and it was a stellar coffee. Our final Gesha is now on the shelf and the pourover bar. I'm at a bit of a loss as to what I should say about it because it's been an emotional trip for me. I have a lot invested in this coffee. I've traveled to Panama several times to build a friendship with the Hartmanns. I've spent years learning about coffee from the farm to the processing facility and into my roaster and finally the cup, so that I know about varieties of coffee and the effect that growing and picking and processing practices have on the inherent flavors and aromatics in the cup. I have 21+ years of roasting experience in which I've changed and manipulated my style to suit my palate, and I've developed an ability to pinpoint a perfect roast profile on a new coffee. And don't forget the almost-14 years of building the DoubleShot, cultivating a quality-focused business that is uncompromising and unapologetic about our care for the coffee. It all adds up to form a large cauldron of experiences that are the basis for my evaluations and opinions about coffee. That load can cause a lot of highs and lows. This morning when I made my first pourover of the Hartmann Gesha Natural #3, I could tell it was going to be a powerful event. And as I drank the coffee, it occurred to me that I was in the middle of the best cup of coffee I've ever had. And each sip, with its lush body and sweet, complex aromatics, took me closer to the bottom of my cup. I thought about the idea that this may very well be the best cup of coffee I will ever taste in my entire life. For whatever reason, the stars aligned and this fleeting moment was in my hands. I felt as though, if I were to die before I reached the end of that cup of coffee, it would be ok. Because this might be as good as it gets. I know this all sounds ludicrous, but the sentiment is truly genuine. And I'd be remiss if I didn't tell you about it. The cup was so profound because it paralleled my life in many ways and opened up tear ducts of history and sobs of joy. You may not have the same experience. And it is so personal that I don't think I want you to. I even feel a little jealous recommending it to you, but I do think you should try it. I promise, this is an amazing coffee. 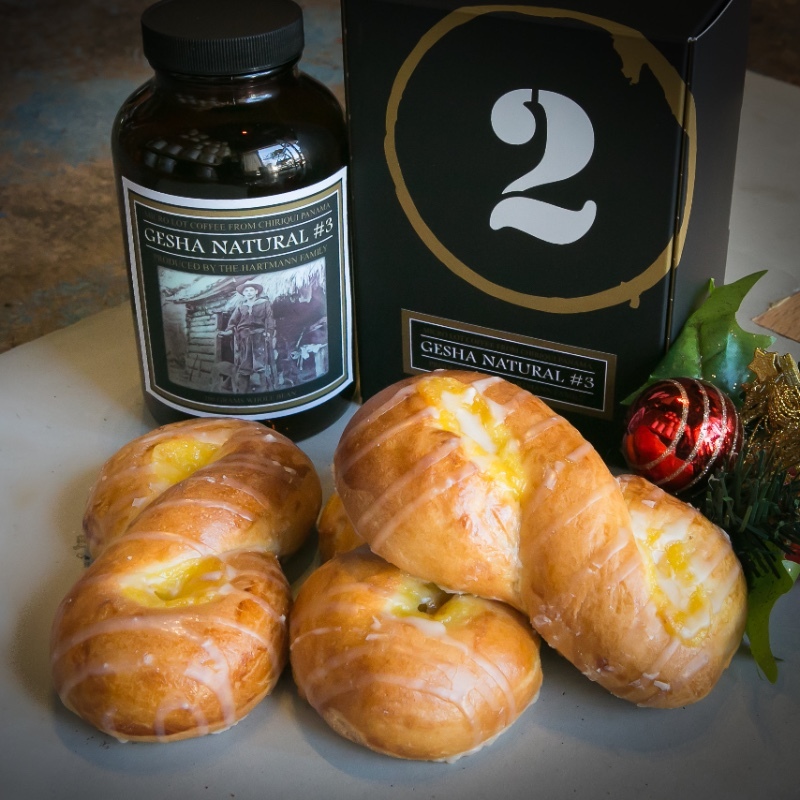 The DoubleShot pastry kitchen developed a Lemon Bun that accentuates the citrus notes in the Gesha. It's fresh baked at the DoubleShot, and the recipe card is available with the coffee. Thanks for going on this journey with us throughout 2017. It's been an exciting ride. Don't forget to pick up coffee for Christmas and Hanukah and we have plenty of cool, coffee-centric gifts for you or your loved ones. ps. Pictured above is Alois Hartmann from around 1930. He was a pioneer in Panama. Read more about him on the Gesha label. The DoubleShot Holiday Coffees are so good this year. It's hard to decide which one to drink each morning, so I've been having all three. Hey, that's the perk of owning the DoubleShot! I roasted our Hartmann Natural Gesha #5 last Thursday and it quickly sold out, but I roasted it again last night and it's back on the shelf and on our pourover bar today. This coffee is one-of-a-kind. I made a cup this morning at home and drank it in the Range on the way to work, and am just enamored with the strong floral aromas that are so much like the fragrance of the delicate coffee flower. Talking to a customer this morning who was earnestly enjoying a pourover of the Gesha, he told me that this is a cup he won't soon forget. And that's it. It's such a remarkable, indulging experience. With all of our holiday coffees this year, the variety of the coffee plant (like a rare and delicious variety of grape for winemaking) is what makes each one so special and unique. But the care in cultivation and harvesting and processing of the coffees are the things that make them so great. If you've been in the DoubleShot lately, you might've run across the latest DoubleShot print newsletter. In it are photos and excerpts from my travel journals from when I visited Panama and Guatemala. I've just posted the entirety of my Panama journal on the DoubleShot blog. Read it while you enjoy a cup of the Hartmann Gesha Natural #5 at home, and you'll see how it all went down. I know this is a lot of information, but knowing all about the coffee makes it even better. So drink it up. 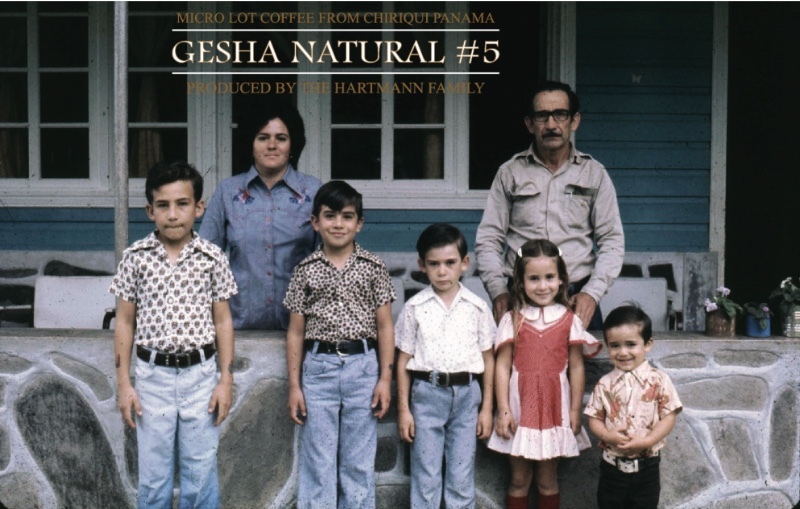 Gesha Natural #5 from Finca Hartmann is available today! This is one of the most interesting, sought-after, and exciting coffee varieties of the world today. Say the word "Gesha" to any true coffee aficionado and watch their eyes light up with thoughts of exquisite aromatics and a desire for just one sip. Panama is well-known for producing the best Gesha coffees anywhere, and Finca Hartmann is at the top in quality and sustainability. I talked to Aliss Hartmann about this coffee last week for the next episode of my podcast, AA Cafe (stay tuned for episode 107). Aliss told me, "When the [Gesha] coffee boom started, it was because the beans were selected and cupped, and they cupped really differently from the rest. That's when it became really famous. It arrived here in 1960, so it really adapted through those years. Adapted to the weather, to the altitude, and everything. So that's part of the success in Panama. Panama really produces one of the best Geshas in the world." What Aliss is too humble to say is that Finca Hartmann produces one of the best Geshas in Panama, and thus, one of the best coffees in the world. And we have it. This coffee is not to be taken for granted. We only have a small amount, and the experience of consuming this will be unlike any coffee experience you've ever had. This particular lot, one of the two I selected when I visited the farm earlier this year, displays a vivid aromatic picture of the coffee flower. It doesn't settle there, as sweet blueberry emerges from the cup with a nice backbone of Darjeeling tea and pleasantly tart lemon. I absolutely love this coffee. It is the best coffee of the year, by far. 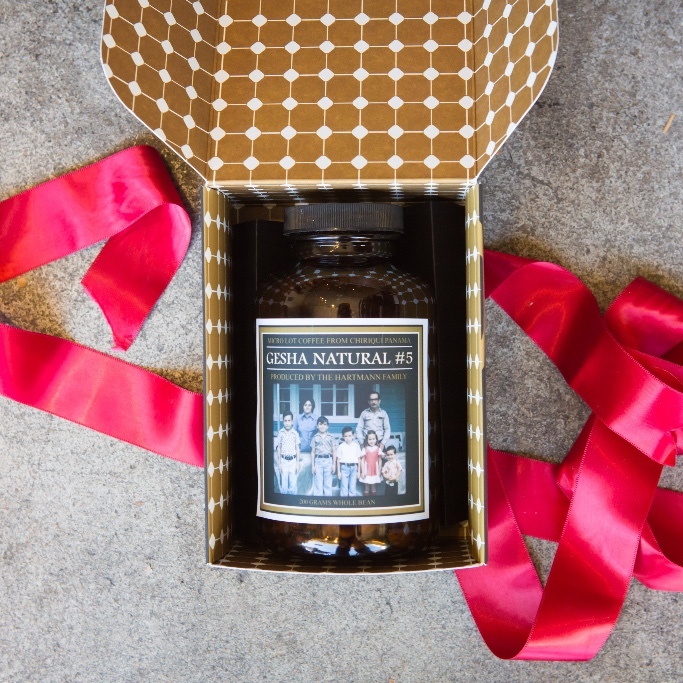 We are selling this in a 200 gram amber glass jar, inside our custom holiday box. 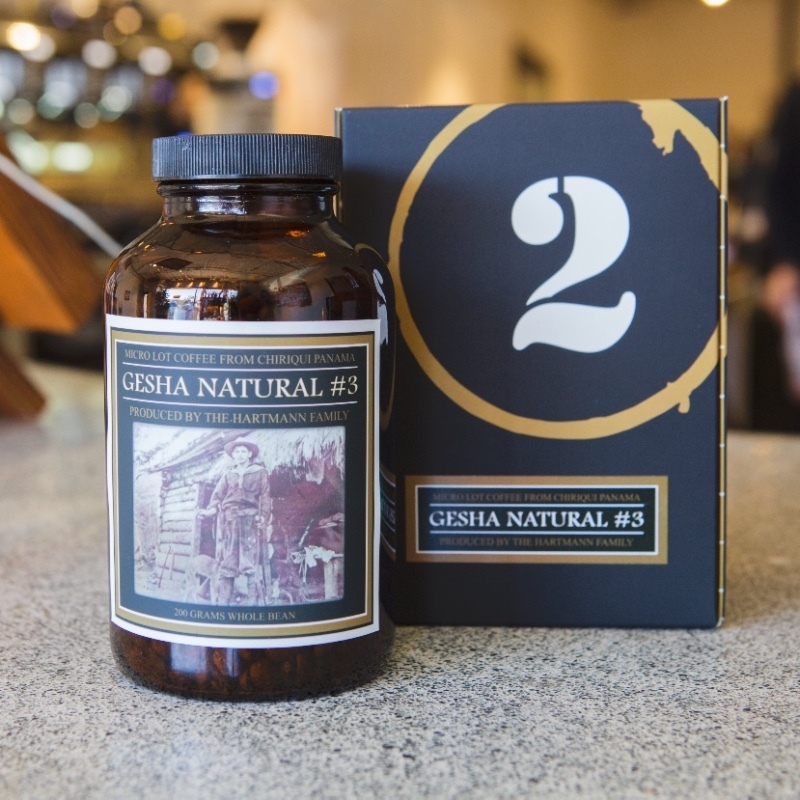 The Gesha is very limited in its availability, and will be in the store and on the DoubleShot website for $40. We are also offering this on our pourover bar for $7 (10 ounce) and $10 (16 ounce). 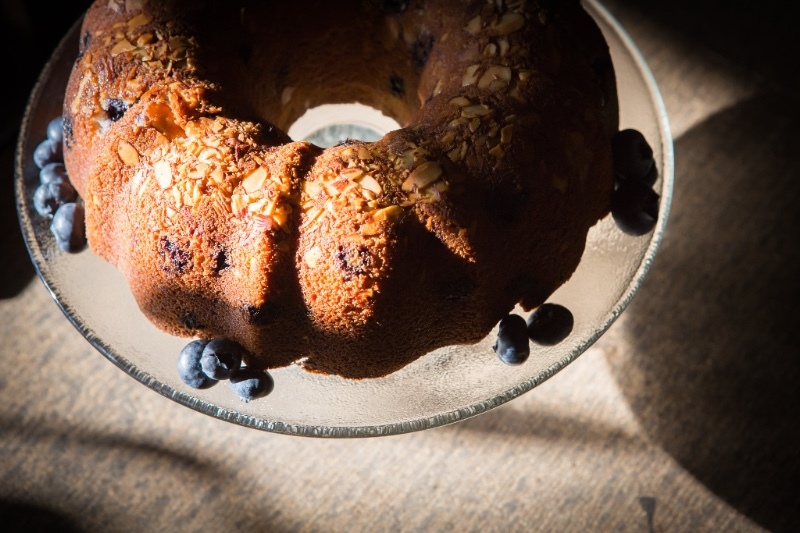 The DoubleShot pastry kitchen created a Blueberry Lemon Coffee Cake that obviously plays on the beautiful aromatics of this coffee. It is for sale at the DoubleShot starting today, and recipe cards are available with the coffee. I'm very excited about this. Happy days at the DoubleShot. 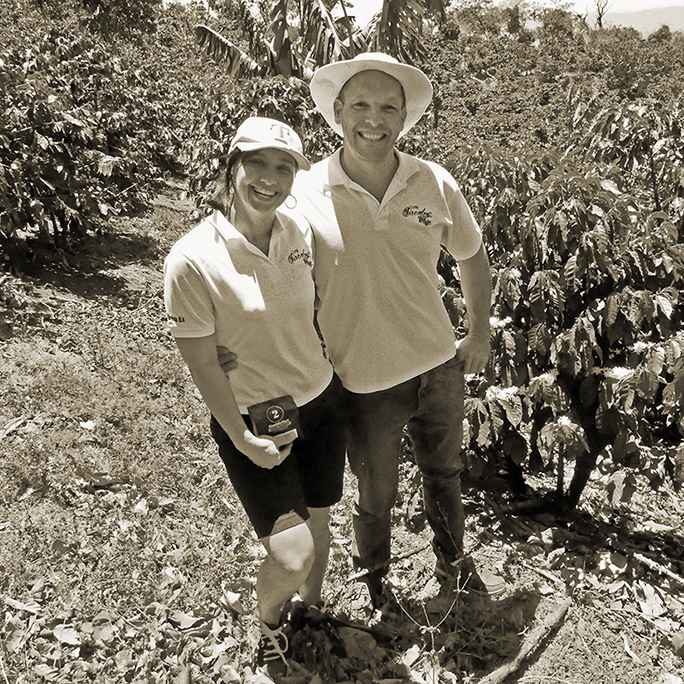 This is Katia and Ricardo Zelaya, producers of our Santa Clara Natural from Antigua, Guatemala. 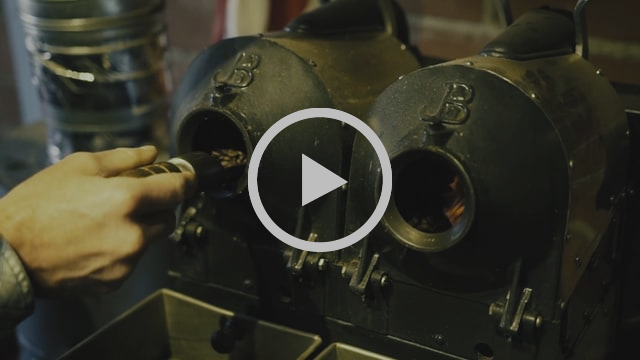 We roasted this coffee for the holidays in 2015 and now it's back. I met Katia and Ricardo earlier this year in Seattle, and I was very excited to talk to them about selling us another lot of their best coffee. 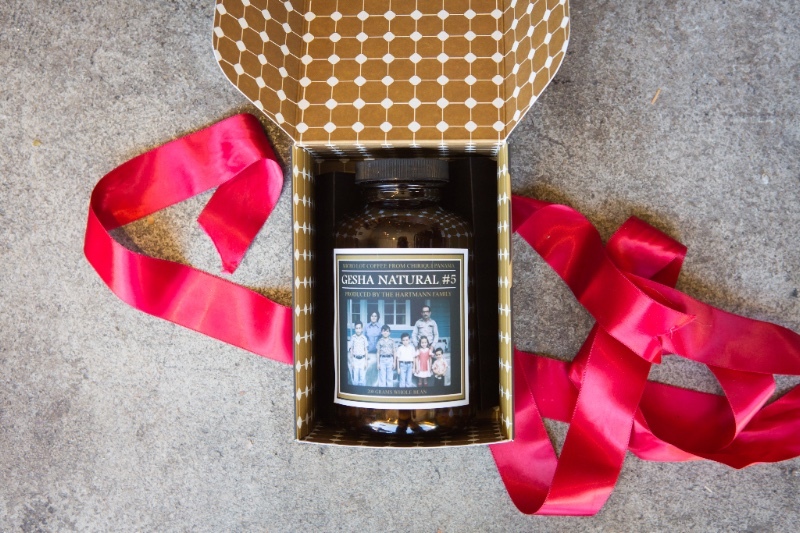 The Santa Clara Natural went on sale Tuesday. We are selling it in whole bean for you to take home, in our special holiday packaging. We are also serving it in the store as a pourover or single-origin espresso. 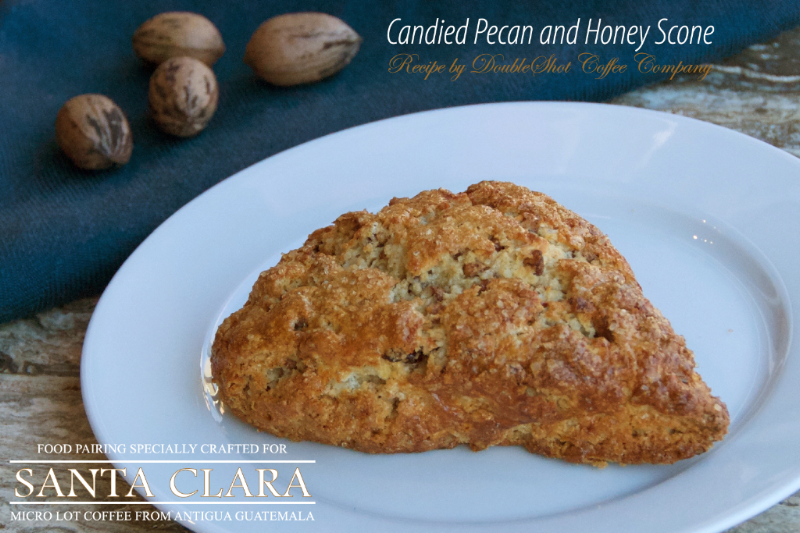 The DoubleShot pastry chefs are serving a candied pecan scone to pair with the coffee, which transforms the cup into a warm autumn treat, like cocoa before the campfire. Yesterday I made a pourover of the Santa Clara and I was drinking it on my way to work. The song Sentimental Sarabande by Benjamin Britten was on the radio, and sound and aroma seemed to coalesce. These soft, lush base flavors morphed, as it cooled, into mild cherry and vanilla that were so pristine and ethereal that I imagined walking into a cathedral and peering up as heavenly shafts of light illuminated the cavernous, arched nave. Enjoy this latest coffee. And keep an eye out for a release of our next podcast, which will feature a phone interview with Katia and Ricardo Zelaya. So today I ate breakfast, then Ryan and I went to the market for snacks and to catch a chicken bus to Santa Maria de Jesus. It’s kind of crazy with all the people, but I talked to the people around me. And then in a very small town our bus stopped. There was a Catholic parade that maybe ended in Antigua and they had grasses arranged in rectangles with nice designs. The dish I just ate was good. It is called “Revolcado.” So I’m not sure that’s what I ordered - it seemed like I was eating pig liver. I’m now at Bacchus smoking a Don Pancho Robusto and drinking Ron Zacapa Centenario. Anyway, we got out of the bus when it was obvious it wasn’t going anywhere. Started walking uphill, uphill, uphill out of town. 7KM to Santa Maria. About half way there the bus caught up with us. It sat 2 hours waiting for the parade. The parade was big. A bunch of young people in Roman soldier costumes playing drums and trumpets. Then a bunch of men in purple robes and hoods walking, some carrying a huge wooden float with Jesus on it. Then a couple full bands and another float carried by women with St. Mary on it. Lots of people. And when it arrived in Antigua, there were thousands of people watching. When we got to Santa Maria de Jesus, we walked down the road. Looking for the trailhead. Past the Mayan clothes washing station and central market. Then we asked. And it turned out we were going the wrong way. So back up the road after Ryan ate at the market. To a graveyard. So we went into a bar to ask again. The guy came out and he was really excited to talk to us. To practice his English. He was funny. His name was Epifueño. Told us several times that it takes 5 or 6 hours to get to the top. Told us that his friend’s uncle died on Tuesday having something to do with his brain. But he didn’t know how to say it and he kept saying [a vulgar word in English]. I laughed a lot. We told him what it meant. Epifueño was trashed and kept spilling his tequila (or was it corn liquor?). Up on the trail we hiked a while then sat down to take in the view and the cool air. Two Mayan families walked by us with horses and their kid on one's back. Then back down, on the chicken bus and back to Antigua. Three Quetzales each way. Well this is good news. We have some new products. We have more holiday coffees about to launch and several other great products you may not know about. Stay tuned for more exciting DoubleShot news. I can't believe Thanksgiving is less than a week away. Time is going by so fast. We're roasting and brewing our first holiday coffee, one I specially selected to serve at Thanksgiving. The Sircof Venecia Honey is great. I'm really pleased with how this coffee is roasting and brewing. The aromas coming from the cup are sweet and complex and unique. That's about all I can ask from a coffee. Thanks to Marco and Maricela Oviedo, who own Finca Sircof and produced this great coffee for our enjoyment. I also love the way our packaging turned out, and I hope you'll appreciate the quality that went into showcasing the coffee within. 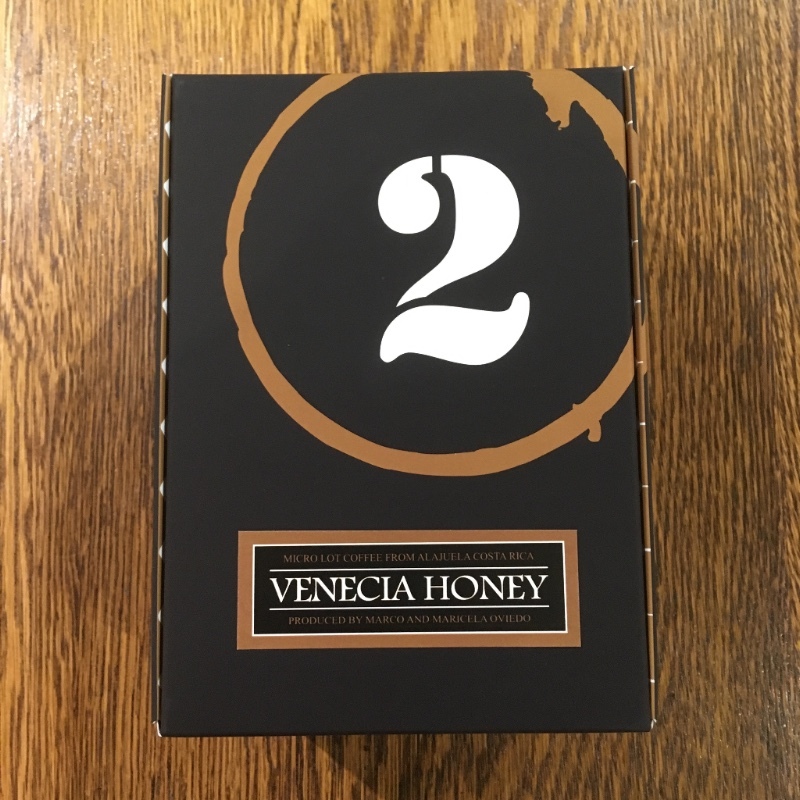 Thanksgiving is next week, so I would recommend that you order the Venecia Honey right away. I'll be shipping coffee today, Saturday, Monday and Tuesday. Any orders shipped on Tuesday may not arrive in time for Thanksgiving unless you opt for Priority Express shipping. Get your order in today so we can ship your coffee ASAP. We will be SHUT on Thanksgiving day and open regular hours other than that. Scroll down to read a snippet! Get some of that coffee. ps. 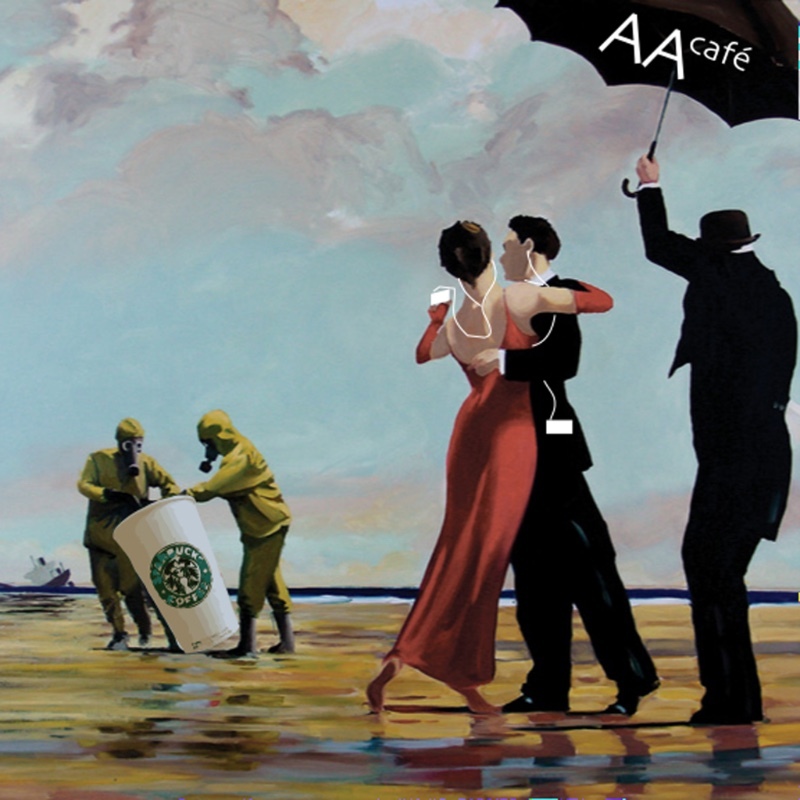 I just released another episode of our podcast, AA Cafe. Click on the image below to hear about my latest trip to Colombia. And the photo of our Sircof farmers will take you to the place you need to go to purchase the Venecia Honey online. At the Hamburguesería in Plaza Real Alajuela again. Took 25 minutes to walk here. I'm the only person in the restaurant. There must be a school nearby – a lot of kids hanging around. Some of the same teenagers I saw last night. I haven't done anything today except pack up and eat breakfast. I grabbed half a bagel and jelly for breakfast tomorrow. So yesterday morning we drove to Finca Sircof. I met Marco Oviedo, whose Sircof Venecia Honey I roasted last November. Marco seems very nice, laid back, and knowledgeable. We walked around his farm. A lot of early flowering. The farm is very clean, organized, and scenic. He trims the bottom branches from all his trees so there is a 1 foot gap between the lowest branches and the ground. This creates a much cleaner-looking farm. He says it's easier to pick. And when they spray the undersides of the leaves, it's easier also. Marco says when you look under the trees you should be able to see if anyone is peeing on the other side of the field. His trees all looked very healthy. He knows what variety they all are. He even stopped at one tree and said this is the most interesting tree in the farm. There are generally two trunks coming up from the plant. They cut all the rest that grow so the two can get all the energy from the root system. This tree had two trunks also, but one is a Villa Sarchi variety and the other half is something else. He says it is a mutation. The Villa Sarchi half produces very well and the other half does not. The leaves are even a different color. He says if the Villa Sarchi half has a very good cup profile, he will collect the seeds and plant them. the farmers are all looking for the next big thing. The next Gesha. The next Cup of Excellence winner. There is a tree near his wet mill that I pulled leaves from. The tender leaves smell like potpourri and they taste like clove. It is called a Jamaica tree and they sometimes use the leaves in cooking. I'm so jealous of all the plants growing in the tropics that have interesting tastes and smells. At 230p I'm catching a shuttle at the airport to go to El Castillo. Tomorrow morning at 6a I will begin a 50 mile race in the rainforest near Arenal Volcano. I'm getting nervous. It's a very exciting day at the DoubleShot. 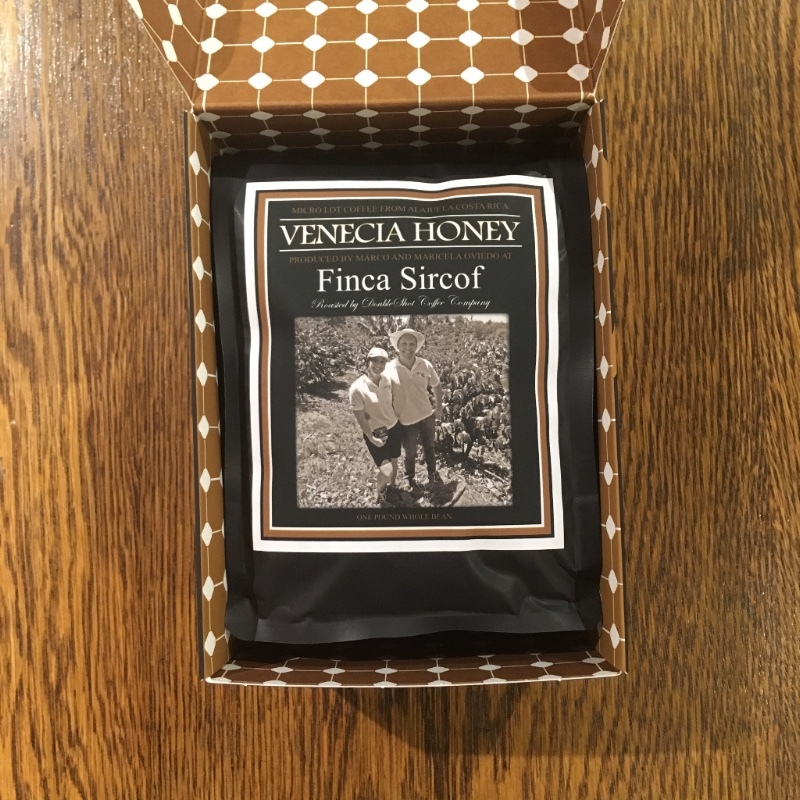 Today we release our first holiday coffee of the year, Sircof Venecia Honey. It's an excellent coffee which was produced in Costa Rica by Marco and Maricela Oviedo (pictured above). I visited Finca Sircof in March and spent some time walking the farm, talking about the details of coffee production, and hanging out with the Oviedos. I roasted the Venecia Honey last night and today we are serving it as a pourover and as single-origin espresso. You can also purchase a pound to brew at home, packaged in a beautiful, custom DoubleShot box. The DoubleShot pastry kitchen created a delicious food pairing for the coffee, evoking the flavors of Autumn and complementing the aromatics in the cup. 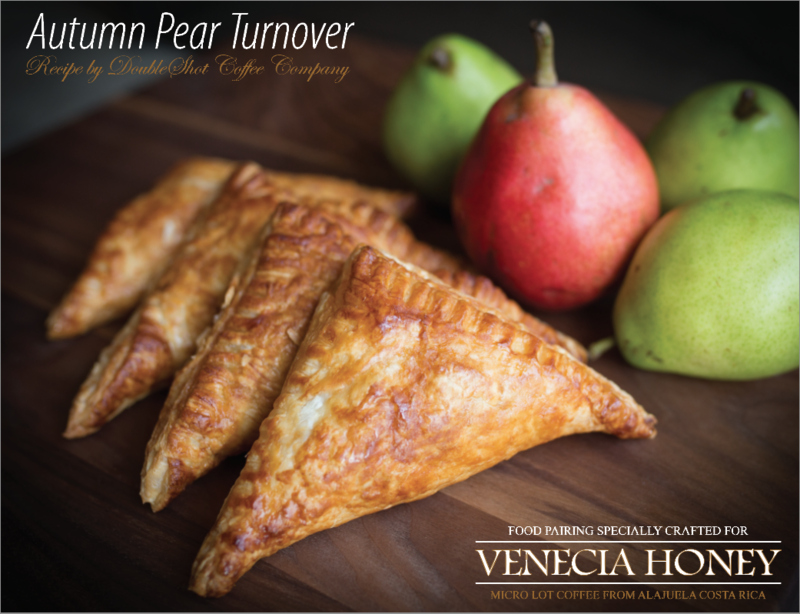 Buy the coffee in the store or online - and we'll give you the recipe for the Autumn Pear Turnover. What a treat. And of course, there's more info online and in the box. 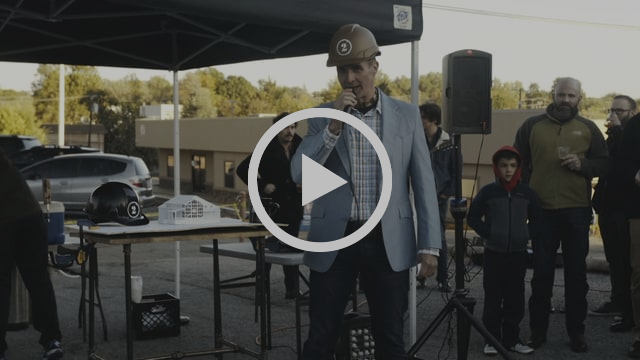 Thank you so much for all the support at last week’s groundbreaking. The weather was a little chilly, but a lot of you came out to listen to me ramble and watch the track hoe scrape some pavement off the site where we will erect The Rookery. I knew this would be a symbolic moment, signifying the start of a monumental build, both for the DoubleShot and for the coffee drinkers of Tulsa. But there were a few things I didn’t realize. When that track hoe dug the first bucket of pavement out of the ground, it seemed to have struck a vein within me, and I could feel my emotions welling up. It was an interwoven combination of thoughts and feelings. I felt pride because I know this is a radical step forward, and it has happened at least partly because of my sacrifices and decisions over many years. There was a sense of relief that we are finally underway, and I’m aware that it is only a matter of time before this project is completed. I had an uneasy feeling in my chest because I know this is only the beginning of a new set of unknown challenges. I thought of the people and circumstances which have driven me to divert course and pursue this big move. And I looked around to see my family, my employees, my friends, my customers… my supporters cheering for progress, happy that a new day will dawn for the DoubleShot, and it will be superb. The designer of The Rookery (and my good friend), Joel Collins has been instrumental in this whole process. Instrumental is not a good word, but I’m at a loss for the right one. His interpretation of my vision and his dogged determination to help me make it happen have been essential in the journey thus far. Joel and I spent the past 5 years designing and redesigning this building. That’s a long time to spend crafting a dream. So, thank you Joel. Yesterday I met a delightful woman who was drinking a latte at the DoubleShot, and she asked me to sit down and chat. When I did, she told me she grew up in Berne, Indiana: the small town where our barn was built and used for a century-and-a-half, housing hay and horses. I was very happy to know that she is so interested in our barn. And she informed me that a lot of people from that community are very excited about a barn from their hometown being relocated to downtown Tulsa, Oklahoma to become the new home of the DoubleShot. I also received an email from a Massachusetts man who is originally from Berne. What a great feeling. This makes it all the more real. Once again I have a sense of satisfaction and purpose, knowing that this project is important to a community of people who have a great deal of pride in the locality of their roots. A land distant from here, whose residents are spread far and wide, but not so different from us. A big shout out to the people of Berne, Indiana. I look forward to the process of building The Rookery, uniting the people of Tulsa over a cup of coffee in an authentically beautiful building evoking the pride of Berne. Let the journey begin.